Earlier this week we all ran over to a small local pumpkin patch and let the kids run around for thirty minutes trying to find the perfect pumpkin for themselves. We had to remind our oldest that if he couldn’t pick it up it was probably a wee bit too bit for him. Our youngest though went immediately for the smallest pumpkins possible. It was adorable seeing him run to the baby pumpkins and ask for all of them. And our daughter, ever the meticulous one spent the longest trying to find that perfect pumpkin. I love watching her little mind work. The next day as soon as the kids got home from school we all went to work. The mission at hand? Operation Pumpkin Carving! I have always enjoyed carving pumpkins. I enjoyed doing it as a child and I enjoy doing it now with my children. I’ve come to learn that when we carve pumpkins it will work one way. The excitement, smiles, giggles and enjoyment from my kids lasts about halfway through the carving experience and then I end up finishing the project. Despite this happening and my fingers having blisters on them and my hands being tired I still go on to carve my pumpkin. It has happened this way since becoming a mom almost ten years ago and you know what? I am perfectly okay with that. Because even though the kids get tired of cutting and I end up finishing it it still allows us to spend time together while having fun together and creating memories. I wouldn’t trade that for anything. My go to carving kit? Pumpkin Masters. I remember using them as a kid so for me there is no other choice when it comes to kits for my family to use. And with them being so easily accessible since they are carried at almost all of our local retailers, drug stores and even craft stores I never have to worry about not finding a kit. This year was the first year I happened to notice the kits specifically for children and dude they.are.awesome! 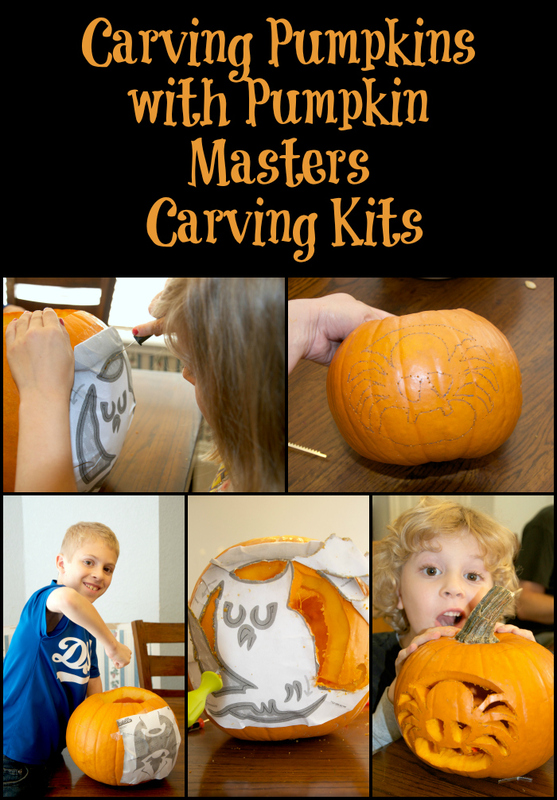 Having little one’s wanting to carve but not being able to is not only hard on the parents but for the children as well. There is nothing like watching your older siblings having a fun time and not being able to partake in the same activity. With the Kid Kits the pictures have pre-stamped holes in them so when you tape them to the pumpkin all they need to do is trace them with the provided crayon and it transfers on to the pumpkin very easily. Simply remove the paper and wha-la you have your pattern ready to go for your little one’s. I also noticed that the cutting knife included is thicker and duller then cutting knives provided in other kits. Much safer for those little hands which if you ask me is one of the most important things when carving pumpkins with my family. That an hearing the giggles and eww’s when the kids reach their hands into the pumpkin to remove the seeds and goop. Seeing their faces is just the cutest thing. Right now through October 31st Pumpkin Masters is having a fun contest where you can win one of SIX prizes which includes $5,000 for the Best Pumpkin decoration! 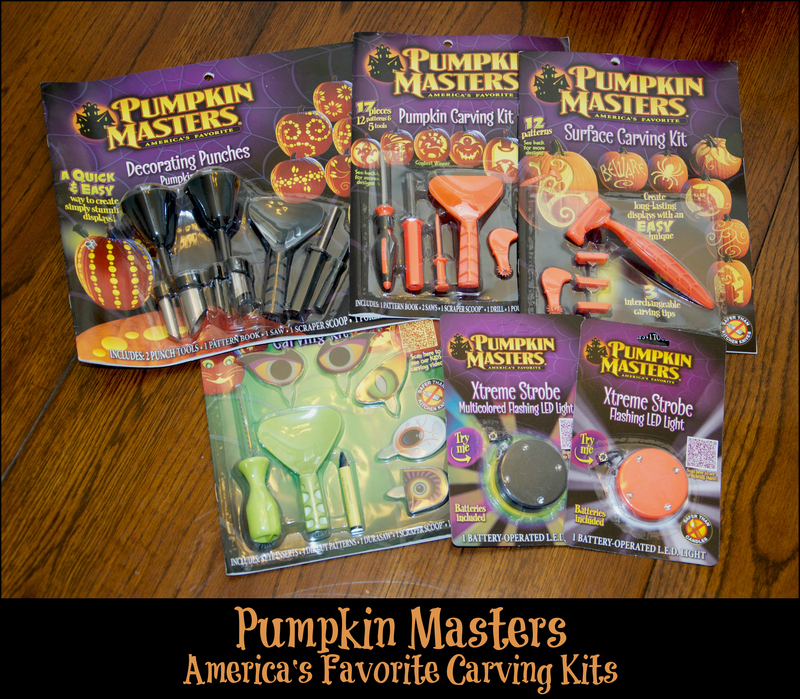 If you are a pumpkin carving master make sure to enter. Here are three different ways you can enter. For official contest details click here. Looks like everyone had a great time & your pumpkins came out fantastic! Thank you Ellen. I don't know what it is but I just love carving pumpkins. Oh I didn't know they made a drill kit! I was actually going to drill all of our pumpkins this year, it hurts my hands to do the traditional carving. Me neither! I was a little bummed we didn't get to use it this time but I'm keeping my fingers crossed next year. They were just too thick and the drill didn't make it through. Such fun! 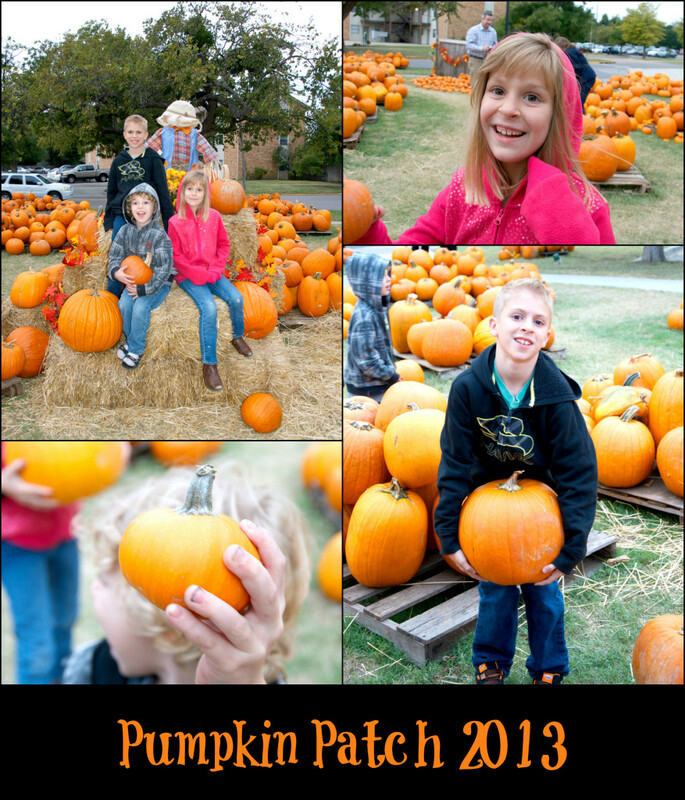 I love the pumpkin picking pics, so bright and cheery! Adorable!! My son said he'll carve it, but I'm in charge of the guts!! EWWW!! LOL that's the best part! I love seeing the kids faces when they remember what's inside and get completely grossed out. Those pumpkins look awesome. Better that I can do!